Update: Piccadilly Artisan Creamery has moved next door to the Coquette Patisserie storefront. The Piccadilly Artisan Yogurt shop on Coventry has closed. 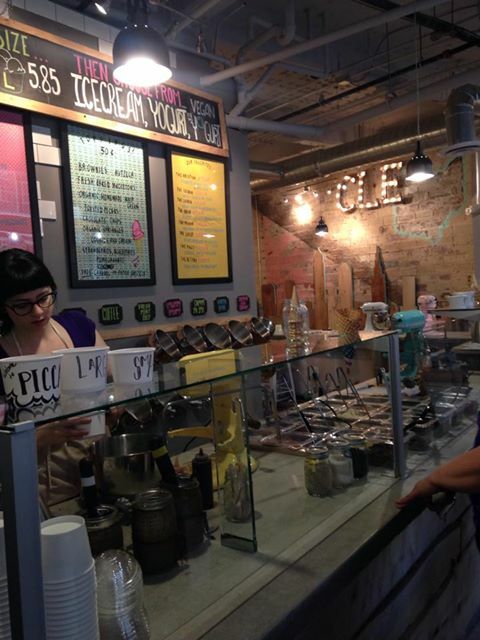 Cleveland has a new ice cream shop, and I have a new favorite place to cool down. I met some friends for drinks at the Katz Club Bar Car on Saturday night. We were in the mood for some boozy shakes, but were told they didn’t serve them in the bar car. Now having a taste for ice cream, we brainstormed where we could go. I suggested Piccadilly Yogurt on Coventry, but another friend suggested the new Piccadilly Artisan Creamery on Euclid. It opened in early June. It’s located right next to Coquette Patisserie, which will be featured soon. This place is so cool! 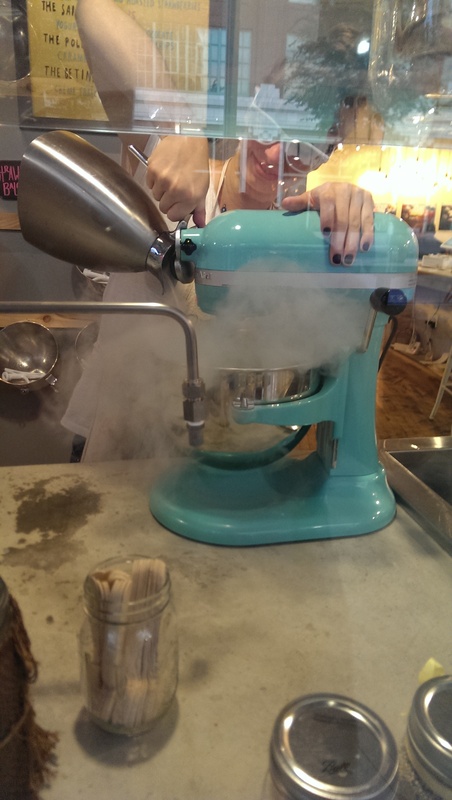 They make the ice cream and yogurt using KitchenAid mixers and liquid nitrogen. The liquid nitrogen immediately freezes the ice cream slurry, not allowing ice crystals to form. 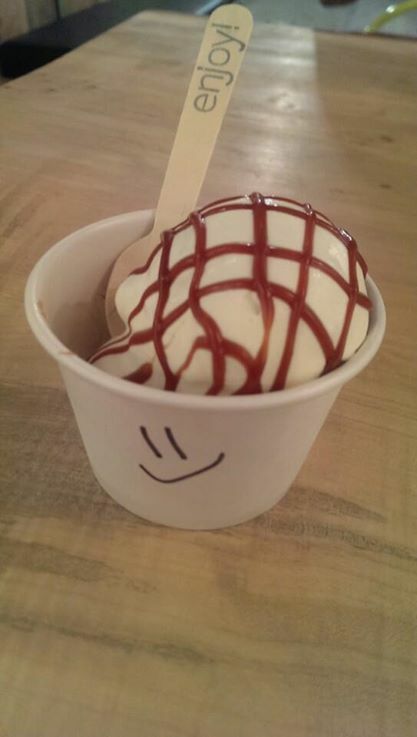 The result is flavorful, creamy ice cream. I was impressed that each flavor had its own designated KitchenAid mixer attachment on the wall. They bill themselves as being “farm-to-cone.” All of the ingredients are organic. They use Ohio grass-fed Amish cows for the highest quality organic milk and cream with no antibiotics or growth hormones. And none of the mix-ins have preservatives or artificial coloring or flavoring either. They suggest you try one of the Favorites listed on the wall your first time out. 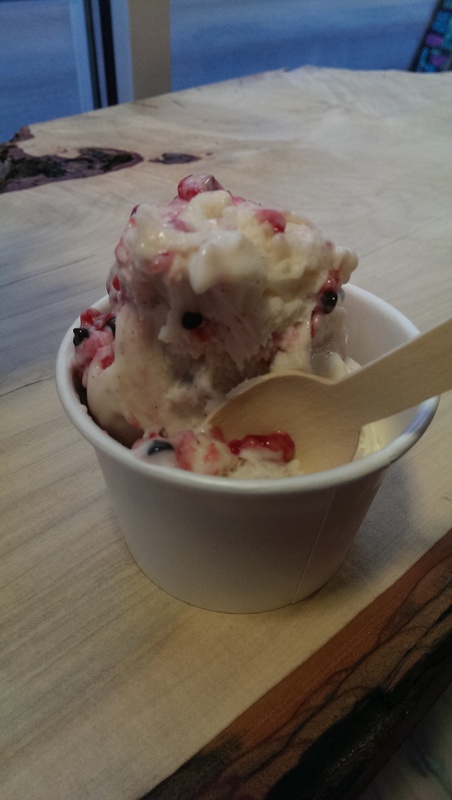 I tried the Sailee, which features frozen yogurt, raspberries and chocolate chips. It was really delicious, creamy with just enough raspberries and chocolate to make it decadent. Then I had bites of my friends’ choices. Wow! They have the Polly – a caramel sea salt and pecan ice cream that will rock your world. We were all in agreement that another friend’s coffee ice cream was undoubtedly the best coffee ice cream any of us have ever tasted. Another friend ordered the Kristina, which features strawberry balsamic ice cream, Nutella and fresh whipped cream. Divine. They even offer vegan choices. The Fresh Mint Leaf Chip tastes like actual, honest-to-god mint leaves and not the artificial mint flavoring of most mint ice creams. They add mini-chocolate chips into the base. With a drizzle of fudge it is refreshing and delicious. My all-time favorite here is the caramelized banana. It is refreshing and great with either chocolate or caramel drizzle. This place is worth the drive no matter where you live. As one of my friends said, it is “stupid good.” You get a show and delicious ice cream for one affordable price.